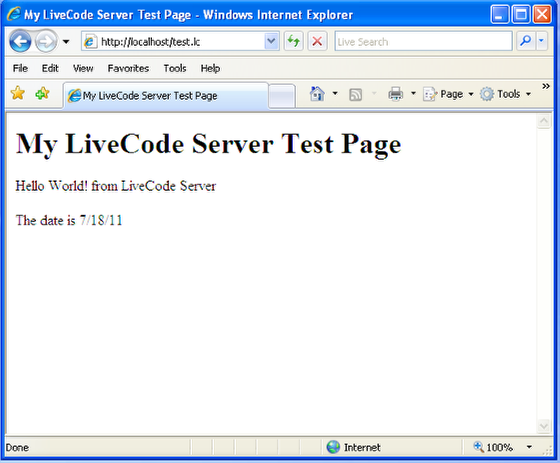 LiveCode LessonsLiveCode LessonsHow To - LiveCode Server Tasks Installing LiveCode ServerHow do I install LiveCode Server on Windows with Apache? How do I install LiveCode Server on Windows with Apache? The LiveCode Server product brings our english like language to the server environment. The server engine is a separate build of the LiveCode engine with specific syntax and functionality that makes it suitable for use in command-line contexts and, in particular, as a CGI processor. This lesson will walk you through the steps required to install LiveCode Server on Windows with Apache. This lessons assumes you have access to your system's Apache configuration files. If you do not, see the the lesson "How to install LiveCode Server with Apache via .htaccess?" Before starting, read the lesson "How do I install LiveCode Server". Apache is the most most popular web server package available today. Installing Apache will allow your machine to function as a web server, hosting websites and serving web pages. If you do not have Apache set up on your systems already, you will need to download and install the latest version. Apache installers for Windows can be found here: http://httpd.apache.org/download.cgi#apache22. Apache can also be installed as part of a WAMP package (Windows Apache MySQL PHP). 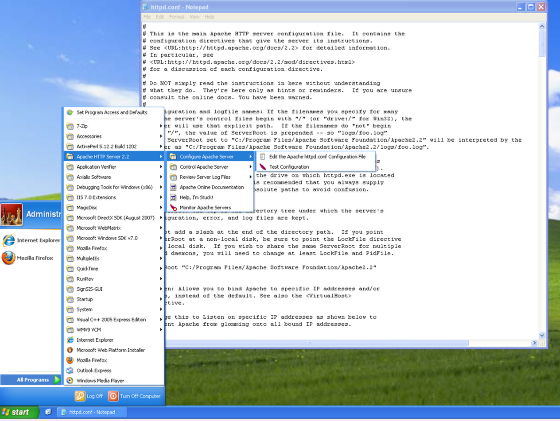 See this Wikipedia page for a comparison of WAMP packages available: http://en.wikipedia.org/wiki/Comparison_of_WAMPs. Begin by downloading the LiveCode server zip file for Windows using the instructions detailed in the lesson "How do I install LiveCode Server?". Unzip the package into your desired location - for example in your home folder. Once Apache has been installed, you can start and stop the service using the utilities accessible via the "Apache HTTP Server" entry in the Start menu. Select the "Control Apache Server" entry and click on "Start" to being running Apache. Your machine should now be functioning as a web server. 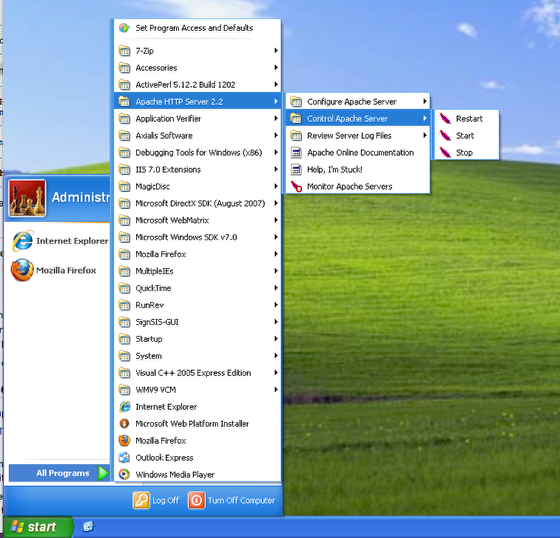 In addition to the Start menu entry, once running, Apache also provides a System Tray icon for managing the services. Here you can start and stop any Apache services running on your system. Next, you need to alter the Apache configuration file so that it associates .lc extensions with the LiveCode Server engine. To do this, open up the main Apache configuration file in WordPad. You can either do this using the Start menu shortcut shown in the image above or by navigating to the file directly. By default, the file is located at "C:\Program Files\Apache Software Foundation\Apache2.2\conf\httpd.conf". ScriptAlias /livecode-cgi/livecode-server.exe "<path to LiveCode Server folder>/livecode-server.exe"
Here <path to LiveCode Server folder> is the full path to the folder you unzipped the LiveCode Server files into. Once you have updated your configuration file, you must restart Apache. You can do this either by using the utilities provided in the Start menu or by the using the "Restart" option System Tray icon as in the image above. You are now ready to test your installation. To do this, create a file named "test.lc" in your document root folder. Your document root folder is defined in your Apache configuration file and can be found using the interactions defined in the step "Setting up LiveCode Server as a CGI engine". By default, this folder is located at "C:\Program Files\Apache Software Foundation\Apache2.2\htdocs\". For more detailed information on installing LiveCode server, see the server release notes distributed with the server package. Prev: How do I install LiveCode Server on OS X with Apache? Next: How do I install LiveCode Server on Linux with Apache? How do I install LiveCode Server on OS X with Apache? How do I install LiveCode Server on Linux with Apache? How do I install LiveCode Server with Apache via .htaccess? How do I choose which LiveCode Server engine to use with On-Rev? How do I add Multiple LiveCode Files in LiveCode Server? How do I use stacks with LiveCode Server? How do I pass information to LiveCode Server scripts? How do I handle user input using LiveCode Server? How Do I Use AJAX with LiveCode Server?